I recently had the experience of someone being the first to read my novel, the first to ever read my work. In other words, I had an alpha reader. An alpha reader is the person who looks at your novel for the first time. The first set of eyes to glare at it after you. ;-) Some people have critique partners do this, or friends or family. I would suggest someone who knows you well enough to give positive but honest critique and lots of encouragement. My mom was my alpha reader. Now of course I learned something from her (how could I not? ), but this post is about what I learned from someone reading my novel for the first time. We writers are so infamous for thinking our work is the worst to ever be created. Alphas come in as innocent readers who have no knowledge of the ugly parts of the novel you've tried to hide. When you read your novel, you look for the worst parts of it; they are looking for the best parts of it. You'll come to realize that your novel is not the mess of chapters and scenes you think it is, which will give you a huge confidence boost. Writers usually know when there's something off about a scene. If your alpha notices it, don't deny it. They're like a conscience you can physically hear, repeating what your writer mind has told you: this scene doesn't work. If your alpha isn't a writer, they might not be able to diagnose the problem, but they have great instincts for when they just aren't buying something. This goes hand and hand with point #2. I think everyone who has ever had someone else look at their novel is surprised by the crazy ideas their readers bring to the table. And why not try one? Several I took to heart ended up making my book ten times better than before. Any alpha will get tired of you wincing and saying this is the worst scene in the world and that you should cut it when they're trying to help you. And if they give you a compliment, don't brush it off. You're getting acknowledged for your work. Yes, you need to work on a lot, but be kind to yourself. Admit that the certain section was better than others. Admit it: writing can be hilariously funny at times, just in general. This is obvious, right? But is it? I can think of a dozen times when, being asked a question about a certain scene, I paused and realized wow, I have no idea what the character was thinking/feeling here. It's good to recognize those points so you can catch them next time. Your book isn't going to be perfect after you take the alpha's feedback and work on it. It's just another step, preparing your book for betas who will have a more critical eye for plot and characters. And maybe, after your alpha reads your novel, you'll look back and realize that some points aren't strong enough, and your alpha missed them as well. "Hey, I need to rewrite three chapters," I told her. "But I need help brainstorming." Being the wonderful mother she is, she came downstairs and brainstormed with me until I was able to fix those chapters. I know my novel isn't perfect now that those nasty scenes are gone, but it's better than before. Just like life, it's a process of constant improvement. Don't be afraid to share your work. Bring it out of the darkness of your brutal self-critic. Let someone else look at it and urge you along in your writing journey. You'll know when you're ready. You just have to take that step and do it. Just do it. 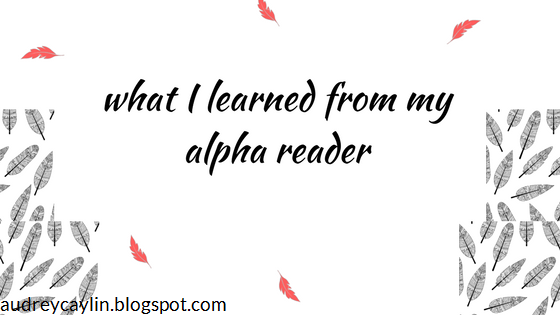 So... have you worked with alpha readers before? Were they family or friends? What did YOU learn about sharing your novel with someone else for the first time? What an encouraging and inspirational post, Audrey, thank you! <3 I needed to hear this, haha ;) I'll definitely try keep these things in mind as I write. This was so encouraging, because I am currently getting one of my novels ready for alpha readers. And this is going to be the first time that I share a WHOLE novel with people. Good points! well since I haven't shared my novel with anyone (since it's not finished yet) I would say nothing :P But those are some good point. I tend to look for criticisms and not positive feedback. The reason is because I grow more from critics then from high-fives. It's like when I draw something and I show someone else. I'm not really looking for "wow that's really cool! good job!" I'm looking for that person that is like "It's okay but you need to..." That is where I grow the most. Again these are some good point, great post! These are some amazing tips and I'll keep them in mind both as I'm writing and as I get to the alpha stage. Thank you! This post was helpful, Audrey! I was originally going to skip alpha readers and go straight to beta readers. But after reading your post, I think I'll use an alpha reader. Ahhh! Thank you, Amy! :D Happy writing and reading! Sometimes I feel that I ask myself that too much :P After I had my novel alpha-read though, my confidence went up a lot. Even though my mom was my alpha, I was pretty scared too xD I guess it's all part of becoming a better writer. Thank YOU. I'm glad they helped! I almost did the same thing. Then I'd realized that I probably should have someone who knows me look at my work before I sent it out to betas. I hope you have an awesome time with your alpha readers! I think the most critical would be one of my friends :P she has the professional editor thing working for her. Like she would read my blog and be like "you have a typo here and there. And you used the wrong word, did you even bother reading it first?" AAAAAH. I've done that so many times. I try to convince myself that only I can make tweaks to my writing style, but it's the feedback that really helps me grow. My mom gave me so many ideas where I was just like "what? well...I mean, that MIGHT work, but it's a little strange..."